Posted on June 10, 2015 July 31, 2015 by Mark R.
This is Part 1 of a multi-part research series surrounding the Black Monolith phenomena in New Eden. My exploration roams about New Eden took me on a “pilgrimage” to the Eve Gate. It’s a location I’ve been meaning to really visit in-depth for a while, but other matters kept me away for far too long. The journey to the purported source of all humanoid life in the Eve Universe is just something that every Explorer needs to do at least once and this trip was well worth it. Even though I could not reach the actual site of the legendary Eve Gate (it is not warpable), I was nonetheless filled with a tremendous sense of wonder as a looked out toward where it all began. After some time shuffling around the system, I decided to see what else the Genesis region had to offer. Surveying the map, the Dead End system was immediately a point of intrigue. With a name like that, who could resist a trip. Venturing into the system, I was first struck by the the scarcity of locations and objects on the overview. There are no stations, only a handful of planets and moons, and very little activity. The general cosmic scenery, however, is beautiful. The warm red glow of the sun and a richly-colored blue-green nebula are nice adornments for this dark desert. There is, however, one object that immediately catches your eye on the Overview…The Black Monolith. Dropping-in cloaked about 30 km from the celestial beacon in my Stratios, my heart jumped. Nothing really prepares you for seeing it for the first time. In the vivid organic formalism of New Eden, seeing something so simple and Minimal is as shocking as the sheer size of what you are approaching. You have to do a double-take because what you see just can’t be there…it’s so remarkably incongruous with what you’ve come to see before in New Eden. There, guarded by a small fleet of Blood Raiders, is an enormous black rectangular form. The Black Monolith appears to be a stationary physical structure and sits several hundred km away from Dead End (planet) V, Moon V. It is a smooth, reflective object; seemingly devoid of any external markings or defects. The surface of each side appears to be completely uniform and there are no visible ports or other obvious means of accessing the interior. The exact dimensions are hard to measure, but they appear to conform to a ratio of 1:4:9. (I could try some triangulation and geometric manipulation to get exact measurements of each side, but my hunch is that the dimensional ratio itself is the really important element here.) Also worthy of note is the fact that the Monolith’s presence at 30 km away from my ship did not interfere with warp capability. I did not attempt to get closer or decloak due to the formidable Blood Raider complement approximately 60 km from my position so I’m unsure of any effects of the Monolith at closer range or if it would react in any way to my presence (either cloaked or decloaked). The structure’s info window doesn’t reveal much information. There is just one sentence in the description, “It’s full of stars“. The meaning of the statement isn’t clear at this time. My first thought was that it may reference some sort of star-based inscription or map, but the surface was completely devoid of any markings. It could also simply be a statement related to the fact the New Eden is, itself, full of stars and maybe this is an ancient monument erected to commemorate some moment of discovery or feeling of awe related to that observation. You could imagine a scenario in which some intrepid early explorer warped into New Eden through the Eve Gate for the first time and, when asked what he saw on the other side, stared out in the vastness and exclaimed something along the lines of “It’s full of stars!” That possibility may actually have some validity given the proximity to the Eve Gate. The Monolith also doesn’t appear to reflect any particular stars, etc. I also doubt that it physically contains stars…but who knows. I have to be open to any possibility as an Explorer. At a loss for further details, I consulted Mark726’s blog and other sources such as Evelopedia. Mark726’s information confirmed that the structure conformed to a perfect 1:4:9 dimensional ratio but there was little additional information. Evelopedia was a bit more informative and made reference to theories related to the lost Talocan civilization, Sleepers, etc. I’m still sifting through the information and will follow-up with another post soon elucidating my conclusions based on my observations and the available research documentation to date. Given the precisely patterned dimensions of the Monolith (its dimensions are squares of the first three integers in our number system – 1², 2², 3²), there may be some mathematical pattern that explains this moon arrangement or to the system itself, but nothing is immediately apparent. The Dead End system is also a place with a mysterious background in general. It’s proximity to the Eve Gate immediately implies a connection to the oldest aspects of the Eve Universe and the presence of the Monolith isn’t the only strange thing to happen here. In YC 113, the system experienced a considerable degree of unusual drone activity. There was even at least one sighting in this system of the cryptic Awakened Infomorph that is believed to be connected to the Sleeper civilization. 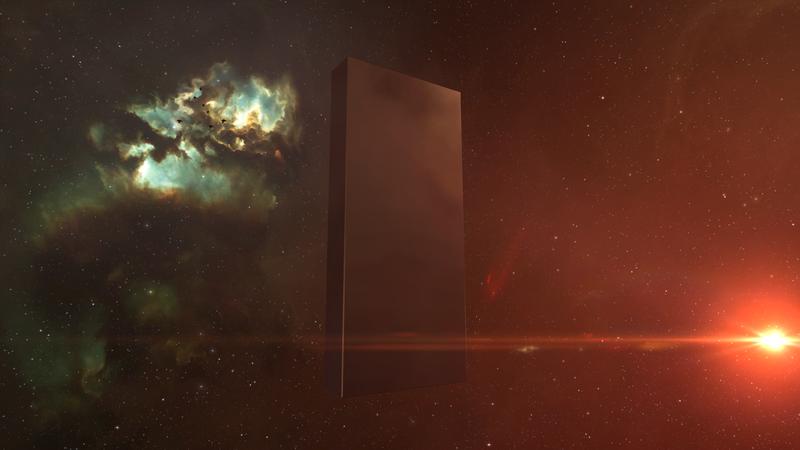 Further investigation suggests that there may have been additional Monolith sightings around New Eden and throughout Wormhole Space where they may be mobile. There are also rumors of a stationary Monolith in Otitoh. This makes me think that the Black Monolith of Dead End may not be a simple monument. It may very well have some much larger significance. With my head swirling with thoughts, I headed to the alleged site in Otitoh, but was repelled by a large number of rogue drones as I tried to access the site. This leads me to suspect that drones be may a common denominator with regards to these structures given the available information. Unfortunately, accessing the purported Otitoh Monolith proved to be much more difficult that I anticipated. It’s allegedly behind two acceleration gates and there are two large garrisons of aggressive drones that must be dealt with. Running through the site cloaked isn’t an option due to the fact that you must at least be uncloaked for a period of time to find the key to the second acceleration gate. I made the mistake of tangling with too many of the nearby rogue drones upon my arrival and my Stratios paid the ultimate price. I should have known better. Warping-in, I was surrounded by capsuleer and drone wrecks. There must have been two dozen of them and so many wrecks in a such a small area is always cause for concern. The sheer volume of these wrecks, coupled with the artifacts and swarming hostile drones meant that the first acceleration gate (which does not require a key) dropped my cloaked Stratios close enough to an object so as to decloak my ship. To make matters worse, the drones were able to disrupt my warp core and the natural phenomena within the site seem to prevent warping out. Between the webifiers, warp disrupters, and barrage of gunfire, my Stratios and Hammerhead II’s weren’t able to hold out long enough and I ultimately lost my ship after bringing down a handful of hostile drones. With the wreck of the Urocyon I burning-up behind me, I navigated my pod back to a nearby Sisters of Eve station, purchased a new Stratios, and then outfitted my new vessel in Jita. I’m now happily flying the newly christened Urocyon II, feeling grateful that I was able to escape in my pod. I’ll be returning to the site soon to continue my exploration and investigation but this time, I think I may enlist the help of some of my Signal Cartel corp mates. Available intelligence suggests that in order to reach this second Monolith under the worst case scenario, the expedition team would need to be able to hack up to 46 cans to find the key to the purported site and defend against a total of 65 aggressive drones, mostly of cruiser size. Assuming we can get through all that (which we can because you can’t stop the Signal! ), my hope is to conduct a detailed survey of this second Monolith and then make comparisons with my findings from Dead End. This will all be covered in Part 2 of this exciting new research endeavor. Stay tuned! 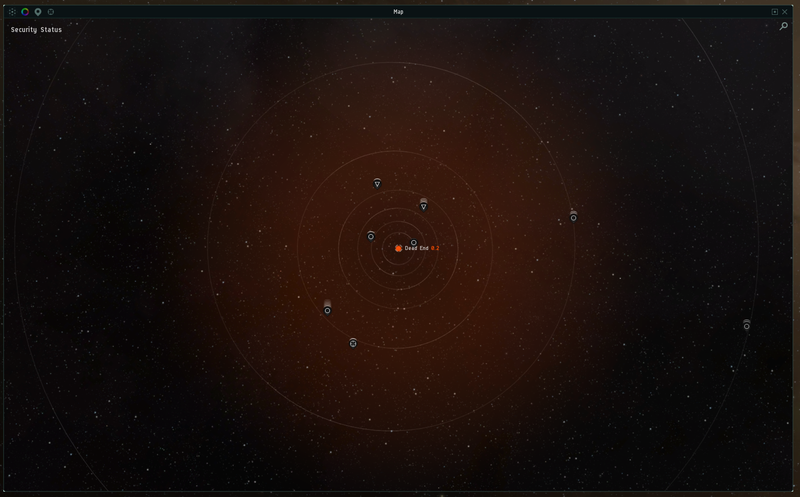 Have you seen Monoliths elsewhere in New Eden? Let me know in the comments section below, via EveMail, or on Twitter @MarkusVulpine. Before I post, was this meant to be an in character, or out of character post? My posts are somewhere between in-character and out-of-character. While recognizing that “It’s full of stars” is a well-known line from 2001: A Space Odyssey, I always try to relate it directly to phenomena in-game as much as possible. I’m not really an RP player, but I do try to let the in-game environment inform me as much as possible. Essentially, rather than just assuming that the Monolith was an easter egg that a CCP developer inserted in the game, I try to approach the question from an “in-game context” standpoint and show how even if it was an easter egg to begin with, it has since become something more as a consequence of the development of the Eve Universe over time. Does that make sense? Disregard, as the post above mine explained the “it’s full of stars” line.